“He was walking a beat and a couple of friendly canine companions - not even sworn into the department - were walking with him. Suddenly they bristled at a pile of packing boxes. Garton checked. Beneath one of the boxes and among them was a thief heavily laden with stolen goods, including several hams”. This very well may have been the seed that was planted for the K-9 Unit. It was here that Bureau of Police Chief O. D. Garton envisioned the use of dogs in police work. Chief Garton was a huntsman who admired and knew the value of a good dog. That night must have stuck with Chief Garton for many years so when the day came he of all people recommended they add dogs to the police department. He began working on making inquiries and studies into the use of the animals in police work. Word went out, and he contacted other police department’s using dogs around the country, inquiring about the use and effectiveness. 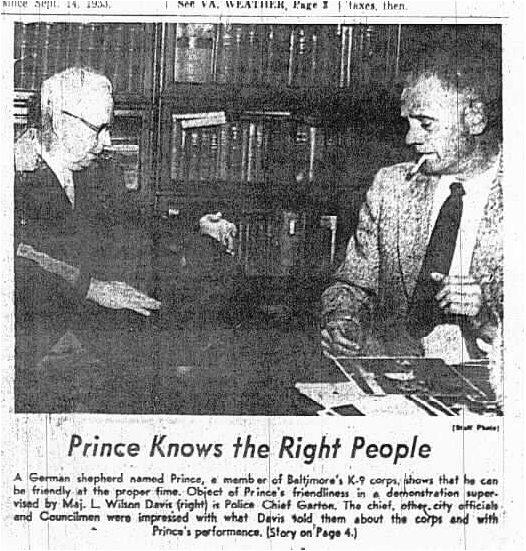 In the late summer of 1957, a conference was held between Colonel O. D. Garton, then Chief of Police of the City of Richmond, and Mr. W. L. Groth, Director of Public Safety for the City of Richmond. Chief Garton, being sold on the idea, was sure that if the City of Richmond had just two dogs that they could help reduce the crimes of purse-snatching and prowlers, who have out run the police before, would certainly be in jail, due to the efforts of the dogs. This conference discussed the issue’s of using German Shepherd Dogs in police work. Within the same year a decision was made to study the feasibility of acquiring dogs for the police in the City of Richmond. Reports were solicited from other cities then using police dogs, such as New York City and Baltimore, Maryland and Portland Oregon. Some of the information was favorable and others were not. Chief Garton and Maj. Davis with canine Prince. Major L. Wilson Davis was the head of the Baltimore Police Canine Squad. He came from outside of the Baltimore Police Department after being in the wholesale produce business and had worked with dogs in the Marine Corps in W.W. II. He was recruited to take over supervision of that department’s canine program. A local dog obedience club in Richmond, whose interest was prompted by the Richmond Police Bureau’s interest in police dogs, invited Major L. Wilson Davis, to visit the City Of Richmond. Major L. Wilson Davis brought with him a 90 lb., three year old German Shepherd named "Prince" who made several appearances and special exhibition before City Council in Richmond and the City Public Safety Officials, along with public hearings for the Virginia Kennel Club, The German Shepherd Dog Club and the Commonwealth Obedience Training Club, were held regarding the use of dogs in police work. Major Davis impressed the area dog lovers with the working ability of the German Shepherds Dogs. Major L. Wilson Davis showed the City of Richmond Officials the capabilities of the dogs in police work by providing statistics of their efforts. The Baltimore Police Department Canine Squad, less than one year old, was already were doing the work that eight to ten patrolman were capable of doing. According to the Police Commissioner in Baltimore, James M. Hepbron, “They patrolled ‘hot’ areas where crime is the heaviest, and there’s nothing a criminal would like less to see than a police dog on his trail”. Davis told the Richmond City Council members, that the street type crimes in Baltimore, such as muggings and pocket picking, have been greatly reduced in the areas controlled by the German Shepherds. Major Davis further indicated that in one month, by using a dog, it had tracked down six men who had terrorized a restaurant. “The dog, a large German Shepherd, stood guard on the men while the police searched them”, stated Davis. “The day before, the same dog tracked a suspect into a building. The suspect elected to crash through a ceiling sky light than face the dog”. Major Davis continued to elaborate about the dog’s capabilities. Knowing that the dog’s ability to smell much better than it’s human counter part can be a great advantage when it comes to tracking a suspect. He further stated that the dogs can run faster and can be trained to attack exactly as directed by their masters. Baltimore’s Police dogs were obedience trained. They were taught to perform basic obedience skills and commands, such as heeling and recalls (coming back to the handler’s side and sit upon return). They were trained to stay under any circumstance and only allowed to move when their master gave the command. The dogs were trained to search for persons in buildings and wooded areas. If the suspect stood still, the dog would not attack. It was a proven fact that the dogs could out perform several police officers in searching and tracking assignments and can accomplish these tasks much quicker than several police officers, thus saving a lot of valuable time. Each dog was assigned to an officer with whom he goes through as rigid training program. Davis stated, that Baltimore’s dogs are put through an eight-week training program but felt that a twelve-week training program would be better. Screening requirements for the selection of the officers were that they must each have a car and have his own home and a yard in which to keep the dog. 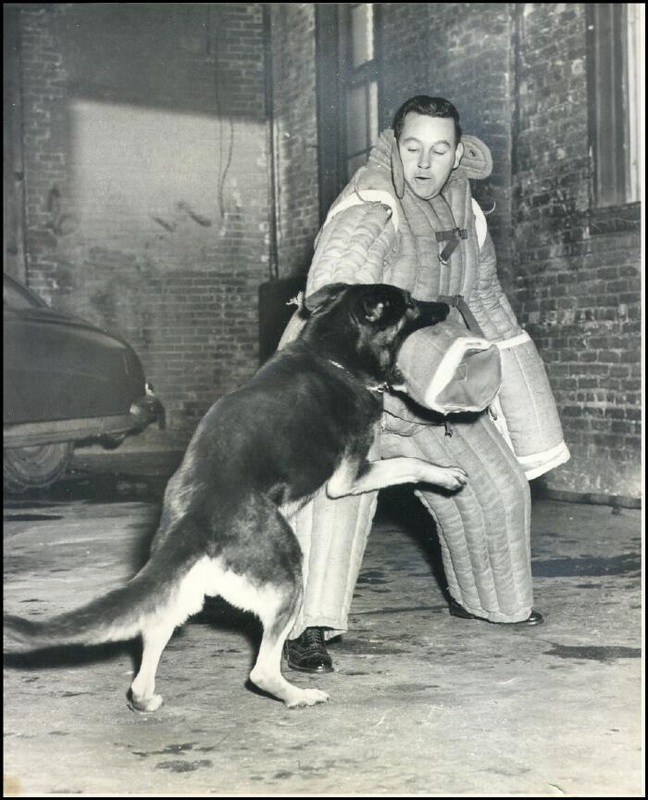 Around November of 1957, after the information and demonstrations that were presented to the City officials by Major Davis from Baltimore, Safety Director W. L. Groth approved the immediate establishment of the first K-9 Corp for the Richmond Bureau of Police. Chief Garton made a public notice through the local newspaper (Richmond Times Dispatch, November 20, 1957) that the Bureau of Police would be interested in hearing from citizens who would be willing to donate dogs for use in the new k9 corps. The department was seeking dog’s preferably male German Shepherds ages one to two years old. In addition to looking for dogs, Chief Garton was asking for citizens who may have some dog training qualifications, and who would be willing to assist the bureau in the new canine training program. Chief Garton stated, “even within the ranks of the Bureau of Police, we’ll rely strictly on volunteers,” Chief Garton said that the first step would be to seek out the best qualified men within the police force “who are interested and willing to follow the rules which are going to apply for working the dogs”. I don’t think we’ll have any problem getting volunteers within the bureau to work with the dogs. We have a lot of men who are good trainers with hunting dogs. It was also at this time that Chief Garton had planned on sending a policeman to Baltimore, Maryland, to observe the dogs in action and bring back detailed reports of the training and the operating procedures. A call was sent through out the bureau for volunteers. Responses were numerous, but applicants were carefully screened. The qualifications for the applicants were exacting and required that each man have a good service record, the proper facilities for providing a good home for the dog, a real desire to work with the dog and the agreement of the wife to have the dog around the house. This last requirement was the most important. Immediately responses came in. Ten dogs were donated to the Bureau from various owners. Chief Garton knew then that only three dogs would be selected. He already had plans as to where they would be placed. He suggested that one dog would be used to the North Side of Richmond and one to the Southside. The other dog would be carried around in a car, a “roving rover” as it was dubbed. It was thought that Sgt Clark would be the rover. 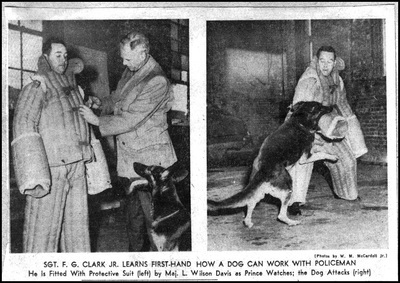 On December 1, 1957, Sergeant Floyd G. (Junie) Clark, Jr., was selected to organize a k-9 corps for the Richmond Bureau Police. His selection was based upon his prior experience with dogs. Even though Sgt. 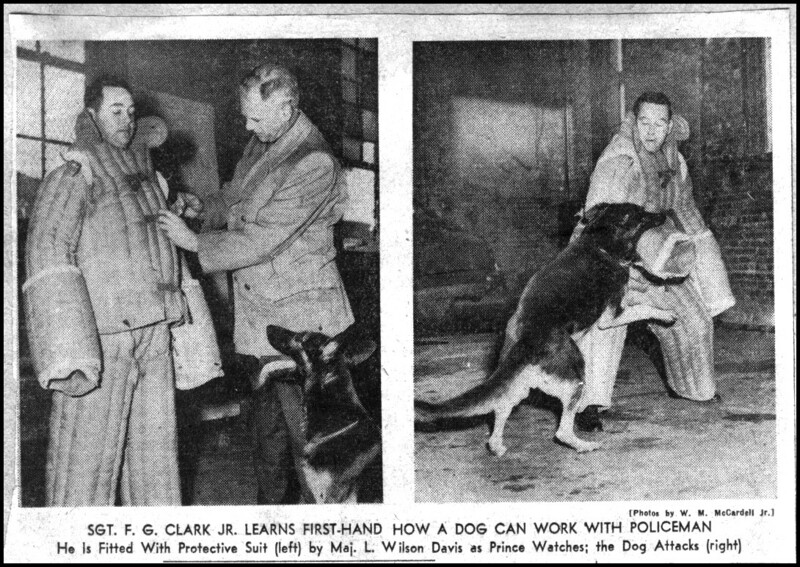 Clark had no formal dog training experience, he still seemed suited for the task and had just been promoted to Sgt. in June of 1957. Sergeant Clark was sent to Baltimore, Maryland, to study training methods procedure for the selection of police dog handlers and how to best utilize the k9 teams in police work. He spent approximately three days, for the purpose of observation and evaluation of dogs being used in police work. Sergeant Clark returned home, convinced that properly trained dogs are an asset to law enforcement. Upon Sgt. Clark’s returned to Richmond, the report was filed with the Chief of Police and the Public safety director. Sgt. Clark noted that the City of Baltimore had a significant reduction in certain types of crime within the city where the dogs were being used. Those crimes were purse snatches, which were down 78 percent in the past year of 1957. Also a reduction in auto thefts, which was down by 40 percent and over all crime was down by 27 percent. Even thought he did not attribute all of the reduction to the dogs, there was some consideration where the dogs were used. Other recommendations included the location for a training obstacle course, which had to be constructed. Consideration was given to the police firing range near Mechanicsville Turnpike just inside Henrico County. Another recommendation suggested was that the officers be given special provisions for certain equipment. One of which was a leather jacket. The men often let the dog’s use their backs as jumping ramp for entry into high windows, Sgt. Clark stated. Other item’s such as costs for the dogs, which include the annual cost of upkeep, was estimated to be around $215.00 each year. These costs included veterinarian fees, estimated to be about $40.00; food cost of about $160.00 a year, leashes, choke chains and incidentals that came to about $15.00. The director said that the initial costs involved could be absorbed, although, of course, a continuation of the program later would have to be budgeted. After evaluating the report from Sgt. Clark, the Chief of Police and the Public Safety Director gave permission to proceed with the organization of the Richmond Bureau of Police K-9 Corps. Below: Sgt. 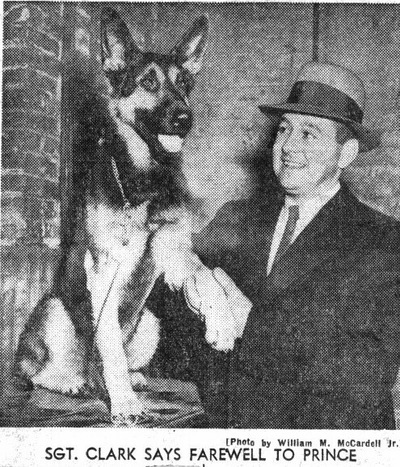 Floyd G. Clark in Baltimore during his three day stay studying the use of police dogs for the pupose of laying the foundation in Richmond, Va.
﻿Chief Garton indicated that the approval of the canine corps program didn’t mean that the selected teams of German Shepherd and uniformed policemen would be patrolling the streets within the next few days or even the next several weeks. Based on a recommendation by Major Davis, of Baltimore, street duty is preceded by a training program of at least twelve weeks. By January 1958, the acquisition of three German Shepherds was made and three officers were assigned. One being Sgt. F. G. Clark and the other two being Patrolman Doug L. Nuckols and Patrolman E. F. Jackson. Sergeant Clark held the opinion that German Shepherds are a breed universally accepted for police work because of its adaptability, alertness, and loyalty. Based on a report from the Baltimore officials, only about one out of every four dogs offered, as a donation would prove to have the necessary temperament suited for the type of work needed in law enforcement. That would mean that the possibility existed that any number, one, two or even three dogs donated might ultimately have to be rejected. On February 18, 1958, after the selection of one additional dog and an additional officer the training began. Officer Crosswhite was teamed with K-9 “Sergeant”, Officer D. L. Nuckols with K-9, “Baron”, Officer E. F. Jackson and K-9, “Major” and Sgt Clark was teamed up with K-9, “Chief”. It was snowy and a cold day as the group headed to the training grounds in Bryan Park (Figure 1) in the North side of Richmond near the Henrico County line. According to a local paper, the area schools were closed and kids were sledding nearby as the first K-9 school was in session. The first matter at hand was the obedience work. It consisted of teaching the dogs to “sit”, “heel”, and “come” when the handlers commanded them. ﻿﻿Even the public got involved to help in the training. One such individual was Bob Richmond who worked at the Spruance Chemical Plant for Dupont. Bob was asked to help in the training because of his interest in dogs. Mr. Richmond was an active member of the Virginia Kennel Club and through his training techniques, had produced excellent results with several of his own dogs. No obstacle course was prepared yet and it was around this time that consideration was given as to where they were going to build jumps and climbs for the training of the dogs. In their spare time, the officers assigned, constructed an obstacle course in a public park (Pine Camp), and located in the north side of the City of Richmond. The course consisted of fence jumps, window jumps, bar jumps, hurdles, nine and ten foot scales (walls), eight-foot ladders and a crawl box. The crawl box was used to teach the dogs to crawl on command under low obstacles. After mastery of the obstacle course and basic obedience work, the dogs began their training in attack work. Major Davis assisted in this phase of the training. During the phases of bite work, the dogs had to be under the handlers constant control at all times, and had to be able to attack and release upon the handlers command. The dogs were required to pursue and attack under gunfire and to cease its apprehension when the suspect surrendered, but to guard the suspect until the handler arrived. Finally, the dogs were taught to track, discriminate between scents, to seek out articles, search buildings room by room and to pursue the search until the suspect was apprehended. During the phase of apprehension work, the dogs had to be under the handlers constant control at all times to release upon the handlers command. The dogs were required to pursue suspects under gunfire and to cease pursuit when the suspect surrendered, but to guard the suspect until the handler arrived. Finally, the dogs were taught to track, to discriminate between scents, to seek out articles to search buildings room by room and to pursue the search until the suspect was apprehended. Other training sessions consisted of taking the dogs to busy sections of the City of Richmond where they were taught to become accustomed to the sounds of a busy city, such as vehicular traffic noises, the crowded areas of the department stores and all of the normal everyday city sights and sounds. After the end of the twelve-week course the dogs and men were then ready for the eight to ten years of service, which could be expected from each dog. Richmond’s first Police K-9 Unit graduated on Saturday, June 7, 1958, in Richmond’s Bryan Park. A special outdoor demonstration and graduation ceremony was held for the four graduating canines and their handlers. During the course of the school all four of the dogs excelled in special areas and upon graduating they were recognized for this ability. K-9 “Fritz”, Sgt. Clark’s k-9, was awarded the best jumper. K-9 “Sergeant” (Ptlm. H. E. Creasy) was awarded the best building searcher. K-9 Captain, (Ptlm. D. L. Nuckols) was awarded the best tracker and K-9 “Major”, (Ptlm. E. F. Jackson) was the best on attack skills. All four dogs were certified in the areas of tracking, searching and attack work and obedience. Now that the dogs had completed the training program, it was time to put all this training to use. It was decided that the dog teams were going to be used in some of the Richmond area’s trouble spot’s. These areas were where the police had a series of break-in’s, purse snatches, robberies and muggings. The k-9 corps would work a walking beat in the areas where some of these events were occurring. On June 10, 1958, the first K-9 team hit the street. The first night of patrolling was not without incident. In a story covered by The Richmond News Leader, dated June 11, 1958, Carl Shires, a reporter with the Newspaper described some of the night’s first events. He covered the incident with K-9 Major and Patrolman E. F. Jackson as they went through the night patrolling the streets of Richmond. Patrolman Jackson and Major were assigned to a beat, which covered the area of Lombardy St. to Meadow St. and Broad St. to Main St. What had occurred was that “Major” was attacked, not by a person but by what was described as a “snarling, scratching, 8 pound bundle of ‘cop-hating,’ black alley cat. It was to have occurred in the 1700 block of Grove Ave. about 11:30 p.m.
As K-9 Major was walking down the sidewalk, he was sniffing some hedges along the path. All of a sudden, from the hedges came an alley cat, which landed on top of Majors head. Major was to have let a loud yelp and shook the cat from its head. The cat, took off running across the street. It was reported that Patrolman E. F. Jackson had his hands full there for a moment. For some of the other patrolman on duty that night they to had some tales to tell. Patrolman Doug Nuckols and his K-9 Captain, assigned to walking beat #10, Harrison St. to Jefferson Ave. and Cary St. to Broad St. As they were walking in the area of Henry St. between Franklin St and Grace St., about 12:15 a. m., Patrolman Nuckols and Captain observed what was described as a fight between two drunks. As the team approached the two individuals, one of the men ran away. Patrolman Nuckols did not release the dog and the man got away. K-9 Captain was utilized to try to track the suspect but lost the scent. Nuckols returned to the scene of the fight and later revealed that what he observed was not just a fight between two drunks but a robbery that was about to take place. It seemed that of the two men who had been drinking, one of the men decided he was going to take approximately $250.00 from the other man. A robbery had been prevented. In another area of the City, Patrolman Creasy and his K-9 counter part, Sergeant, were near Foushee St. and Grace St., who found what appeared to be a break-in to a vehicle. The vehicle was filled with clothes, perhaps the motive for breaking into the vehicle. Patrolman Creasy noticed a man standing near by and may have thought he was a suspect, but further investigation revealed that there was not enough evidence to implicate the man and so he was not arrested. Sgt. Clark and K-9 Fritz were called to 1326 West Broad St. for was thought to be a break in at a house. When Sgt. Clark arrived at the scene the other officers were already inside the residence so Clark could not release his K-9. Having to deal with this obstacle, Sgt Clark and K-9 Fritz still managed to conduct a search of the house without incident. No suspects were found. Sgt. Clark and Fritz cruised the city in a car checking on the other men during the course of the night and made him available for any calls that would require the use of his K-9 counterpart. Patrolman Jackson and K-9 Major walked the beat from Lombardy St, to Meadow St., and from Broad St. to W. Main St. their night was not without out incident either. Patrolman Jackson spotted what he though was a flashlight in an alley about 2:30 a. m. As he investigated, it turned out that it was a man doing some work. Ptlm. Jackson asked that man if he lived in the neighborhood and the man replied he did not. “I live over by the State Fairgrounds” the man replied. “You must live close by”, the man inquired to Jackson, apparently unaware of whom Jackson really was. “ Figured you must live close by to be out walking your dog this time of night”. It was about this time when a glimmer of light must have reflected off of Patrolman Jackson’s badge and the man realizing whom he was talking to turned and walked away after giving a grunt of displeasure. In the first year of service in the city the Police Canine Corps was credited with over 480 arrests, according to information provided by Acting Chief of Police, Major John M Wright. Even though some of the arrests would have been made any way, it was decided that the dogs did provide a certain amount of a psychological deterrent to assist in the catching of criminals. 220 of the arrests were made for drunks and 88 for disorderly, but it was indicated that there were some criminals caught had not been for the use of the k-9. The K-9 Corps was credited for dispersing several unruly crowds and assisting two officers after they broke up a group of nine disorderly men who were having a free-for-all. The k-9 teams were able to subdue the men and placed them up against a wall to search while their canine counterparts stood guard behind them. On one particular incident, police were called to search a warehouse that had been broken into and police officers searched the building for the better part of an hour and a half. Not finding anyone they called in a k-9 officer and his dog. K-9 Fritz and his partner began searching the building and approximately 30 seconds later the criminal was in custody. On another night, k-9 “Fritz” and his human counterpart were called in to look for a man suspected of stealing a car. They observed the suspect in Byrd Park and K-9 “Fritz” chased the suspect up a tree and stayed there until the troops arrived to apprehend him. One of the other K-9 dogs was credited with apprehending two men who had robbed a woman around First and West Broad St.
K-9 “Sergeant” was credited for tracking down a suspect who had abandoned a stolen car in the East End. K-9 “Sergeant” located the man hiding in a yard not far from the stolen car. K-9 “Sergeant” was not without his dues. On one occasion, K-9 “Sergeant” was turned loose to find a criminal accused of assaulting a policeman. When the policemen found the dog, he had found the assailant, on the ground waiting for the officers. Overall, the K-9 Corps was credited for the arrests of 8 felonious assaults, 13 break-and-enters, 2 attempted robberies, and 5 for carrying concealed weapons. The K-9 Corps had proven themselves and word got out about the unit to other agencies. Calls were coming in from other police agencies inquiring about the use and the program used to train the dogs. Inquiries from the Royal Canadian Mounted Police, The FBI, Portsmouth Police, Norfolk Police, Newport News Police, Danville, Petersburg, Liberty Mo., and even as far away as Beverly Hills California. In November of 1959, Safety Director Groth, that City Council look into the possibility of hiring additional policemen and eight additional dogs, made a request. According to the Richmond News Leader, dated November 2nd, 1959, Safety Director Groth expressed his concerns to City Council about the need for additional police officers to provide better police protection. Director Groth indicated that from January 1957 to November of 1957, 87 policemen had quit and left for better paying jobs. At that time Richmond Police Officers starting salaries were approximately $3,588. Officers were leaving the city to outside agencies, which were paying almost $500. To $800.00 more a year. The suggestion was to raise the salary to $5,000.00 in hopes that it would provide some incentive for a new recruit to remain with the Police Bureau. In April of 1960, City Council, again, was hearing the plea from the Bureau of Police for additional manpower. City Council, even at that time, knew that there was something that needed to be done about the growing problem of crime in the City. City Council even by there own recommendation, requested that a new plan to combat street crime had to be addressed. Most members insisted that they wanted a new program and not merely a defense or explanation of the existing police operations. Later in that year, November of 1960, Chief O. D. Garton to Safety Director W. L. Groth, requesting that the Bureau of Police increase the Police Force, submitted a 30-page report. In this written proposal it was requested that the Bureau hire on 20 new additional officers and purchase at least three new police cars. As far as the request for the dogs, Chief Garton requested an undisclosed number of k-9. Mayor Anderson, one of the big supporters of the dogs, stated that he would be willing to support appropriations to finance a 25-dog squad. Other members of City Council also expressed their desire to increase the Squad as well. At the time the report was submitted, the Police bureau there was approximately 392 officers and the four canines. In April of 1960, in an attempt to make the streets safer in the City of Richmond, City Council authorized the addition of 30 policemen and nine more dogs to increase the K-9 Corps to 13. Of the 30 new officers that were hired, the proposal suggested that 16 of the new men should be assigned to the first patrol division on the north side of Richmond, four were to go to the second district on the South Side and nine were sent to the dog squad to increase the K-9 Corps to 13. In July of 1965, the K-9 Corps was again enlarged by nine (9) men and one sergeant. This brought the k-9 corps to strength of two (2) sergeants and twenty one (21) patrolmen. The K-9 Corps was given three (3) additional vehicles enabling them to cover more area and stand ready to assist other officers in building and field searches. The k-9 Corps was assigned on basic shift arrangement. The night shift worked for two weeks from 8:00 p.m. to 4:00 a.m. The day shift worked one week from 7:00 a.m. to 3:00 p.m. . During the week of day shift, the dogs were re-trained for two day’s and the remainder of the week was used for days off accumulated during the previous two weeks. Re-training continued while the men were working on the street at night. This training consisted of attack work, where one member of the corps would dress in old clothing and go into the area where the canine team was on patrol. The officer would conceal himself out of the dogs vision, jump and run when he sees the dog and his handler approaching. Very often this was done without the handlers knowledge. In another instance, an ADT Alarm came in at a local warehouse and officers surrounded the building. A K-9 unit responded and the dog was sent on a building search. Within two minutes after the officer entered the building, returned to the front door and turned the burglar over to the waiting officers. A robbery call came in from a service station in the East End of Richmond. Two of our K-9 units responded and made a systematic search of the area where a Detective had seen a subject running. Both dogs tracked the suspect to where he was hiding. In every instance where dogs have been used to apprehend criminals, they provide more fear than an armed officer. The psychological advantage given the law enforcement officer is hard to beat, when he has well trained dog at his side to aid him in all circumstances. The Richmond public has accepted the K-9 Corps wholeheartedly. Various civic groups frequently call upon K-9 Officers to give lectures and demonstrations. The dogs attract a lot of attention and interest. Their activities have created much favorable publicity for the Richmond Police Department. It is felt that the “Canine Patrolman” are doing a fine job for our Department and played an extensive part in bringing about an improved crime picture in our city. 1978 - The Canine Units was moved to the precincts. In 1978 the canine unit was removed from its location on Forest Lawn Dr. and moved to the precinct’s. There were two canine officers assigned to each platoon in the precinct, and there were four platoons in each precinct. The Officers along with their canines were assigned to the precincts. This was due to an incident, which involved a prisoner being bitten by a dog. The trainer Clarence Camden remained at the training site, where he conducted re-training from there. The officers were also assigned to walking beats. A canine officer in a unit took them to their assigned beats. At this time there were approximately 26 canine teams. In 1987 the canine unit was reassigned back to the forest lawn location and became a unit again under one roof. The Officer in Charge at this time was Sgt. Robert Gray. In 1991 Sgt. David L. Martin was assigned to the Canine Unit as Officer in Charge. In 1997 Sgt. Jack E. King was assigned to the canine unit as the Officer in Charge. In 1997, the Richmond Police Canine Unit creates the units first set of trading cards. These were designed to be used to hand out to children and an adult alike, during community function’s and demos. The trading cards show a photo of the Officer and his canine companion, with a brief description of the Handler and the canine. These cards were used to help present a personal touch to the officers on the street as well as well as the many kids they came in contact with during public talks and demonstrations. Since the inception of the Richmond Police K-9 Unit, many changes have taken place over the years. As of May of 1998 the unit is comprised of one Sgt. and thirteen (13) officers. Of those thirteen officers, there are eight (8) Patrol Canine’s, One (1) Explosive/Weapons Detector Canine and four (4) Narcotic Detector Canines. In 1996 The Richmond Police Department adds an Explosive/Weapons Detector Canine to the Unit. The Officer and his canine respond to calls of bomb threats within the business and educational facilities in our community. This canine is also called upon to conduct area searches for weapons that may have been discarded by a fleeing suspect wanted by the police or of a crime scene or where a weapon was used in the commission of a crime but is unable to be located. The Richmond Police Canine Unit is currently in the process of being nationally accredited. This will allow the unit to be recognized nationally for its training facility and certification’s. The unit currently has three trainers who are responsible for training new handlers and canines. In addition they are responsible for maintaining re-training on a regular basis and to keep the canine teams proficient at their required tasks. Of the three trainers, two (2) are Utility Canine and One (1) Detector Canine Trainer’s. In the fall of 1998 that the Richmond Police Department K9 Unit was nationally accredited. The accreditation was done through the North American Police Work Dog Association. National Accreditation allows the Richmond Police Canine facility to be used for certifying canines from across the country and thought the organizations of the Virginia Police Work Dog Association as well as the North American Police Work Dog Association. In May of 1998, The Richmond Police Canine Unit starts it’s first Passive Narcotic Detector canine school. The school consists of two new handlers to be taught the use of a Passive Narcotic Detector Canine. The passive dogs were designed to sniff and detect illegal narcotics hidden on person’s. The dogs response was to sit when it detected the narcotics. This is the First time The City of Richmond will have it’s first two Passive Drug Dogs. In May of 1998, the Richmond Police Department Canine Unit conducted it’s very first Narcotic Detector Canine School. The school consisted of twelve weeks of training. Their were three handlers and three canines. One of the dogs was a positive response canine and the other two were passive alert canine’s. The school was taught by Officer H. E. Pherson, Jr. and students were Officer Jeff Like and Officer Robin Shelton. Officer Pherson in addition to running the school trained himself another positive response canine. The dog’s that graduated were K9 ARNO, positive response, and K9 Brody and Thunder, passive response. One of the longest times a canine has spent working in the canine unit was a German Shepherd named “SAM”. “SAM” started his career with the unit 13 years ago and worked most of his life if not all of it, with Officer Lewis Hoffman. Sam retired after a long dedicated service to the unit with numerous apprehensions of suspect’s to his credit. Officer Lewis Hoffman also retired after a service career of 24 years of dedicated service to the canine unit and the Richmond Police Department. They will be deeply missed. The Richmond Police Canine Unit still continues in it’s effort to provide the community with the public service and support by providing public talk’s and demonstrations to the area communities and civic organizations. In addition to many of the public relation function’s the officer and dogs still perform their many police duties by providing additional police support to the men and women of the Richmond Police Department.